Close to the remote northern tip of Cape York Peninsula lies a boundless wilderness of tall rainforest straight out of Jurassic Park. The jungle-like vegetation replicates the steaming tropical rainforests of New Guinea, with dense foliage, twisting vines and a tall canopy. It has many foaming rivers descending precipitous slopes running down to the Coral Sea. The mighty Jardine River rises in the eastern mountains and is Queensland’s largest perennially-flowing river. 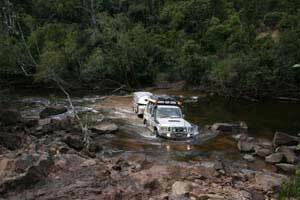 Jardine River National Park is reached via the challenging Old Telegraph Track, where a 4WD vehicle is essential. Supplies and fuel can be obtained at Bamaga, the main town in the north, and visitors to the park must be self-sufficient. Camping is permitted in two areas on the banks of the Jardine River. Also at Eliot Falls and the famous Captain Billy Landing in the adjacent Heathlands Reserve. Visitors need to register with the ranger at park headquarters on arrival. The eastern coastline boundary of the park and the offshore reefs and islands form part of the Great Barrier Reef Marine Park. Along the coast are vast white siliceous sand dunes peppered with thick vegetation - an impressive sight. A striking feature of Jardine River National Park is the sheer abundance of water in fast-flowing streams, swampy depressions, lakes and lagoons. It was these almost impassable obstacles, along with thickets of vine scrub, heath and bogs bordering the river, that tested the early explorers like Edmund Kennedy, who was speared to death only days away from achieving his objective of reaching Cape York. The first settlers, like the Jardine Brothers, who drove their cattle 1000km to the ‘Tip’, were also delayed crossing this region. Today this ‘wet desert’ is a forbidding sight even at the height of the dry season. The Jardine River is the traditional home of several Aboriginal tribes. It is a living cultural landscape with many named features, story places and mythical beings. Ancient occupation and ceremonial sites exist throughout the region. 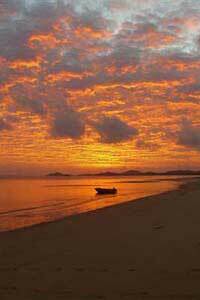 This outstanding park is one of the highlights of any visit to Cape York. It is rare glimpse into a untouched wilderness where you can find many surprises, as well as great serenity and silence.